When we do business with a company, we want to know that the arrangement is straightforward and our interests are protected. That requires you to see into the mechanics of the relationship and quickly understand 1) what you’re getting and when and 2) what it will costs you so that you know that the scales are balanced. When it comes to consumer finance, it is an accepted fact that transparency doesn’t really exist. Consumer finance customers live in a fog of mouse type, omitted details, legalese, and clunky, confusing user experiences. As a result, trust is low. It’s easy to apply for a credit card, but hard to figure out what’s happening with their application at any given time. It’s easy to open a bank account, but hard to understand what the various fees will be. It’s easy to apply for a credit line, but hard to figure out how much it costs and what the terms are. Consumer finance companies may appear to benefit from the lack of transparency. The lack of information gives them power in the relationship with their consumers, but it tends to undermine the customer’s overall peace of mind. Just imagine how well received consumer finance companies would be if they took the opposite approach and gave the consumers the transparency they crave. What if they made the consumer’s peace of mind a goal. What do consumer finance customers want? Customers want to move seamlessly through their transactions. They want to know exactly what’s happening with an application or request, what the fees, rates and other costs will be, how long an application will take, and when they can access the money or services. They want a simple, straightforward explanation of the features and benefits of financial products and services. They want funds fast and they want consistent, yet personalized experiences across every channel. And they want access to a human being when they have questions. According to Gartner, 85% of customer interactions will be automated by 2020. Customer experience consultants Servion predicts that AI will power 95% of all customer interactions, including live and online conversations that will leave customers unable to ‘spot the bot.’ People still like having a person when they need one, but self-service tools can offer quicker, easier access to basic information and resources. Consider leaning into these self-service tools, which give customers the feeling of control in solving their own issues. For example, allow customers to download tax forms directly, rather than having to request one and wait for it to come in the mail. This approach to conveying the details can help them eliminate some of the exhaustive web research they would otherwise wind up doing and reduces complexity — a loyalty turn-off. It also reduces their exposure to different providers, which can result in either a lost sale to a competitor, or information overload that prompts the customer to abandon the transaction entirely. Make sure that customer feedback doesn’t fall into a black hole. That means monitoring and responding to complaints and questions in a meaningful way that amounts to more than just excuses along the lines of, “We can’t do that.” Let them know that you’ve heard their concerns and tell them specifically what you’re doing to change things and when. A survey by Microsoft found that found that when a company acts on customer feedback, 97 percent of consumers are likely to become loyal. In other words, people like to know that they’re being listened to and that their concerns are being taken seriously. Another piece of creating transparency for customers is providing clear expectations, and then making sure the company delivers as promised. Consider how online order and package tracking creates trust and transparency in online shopping. In the best cases, an email receipt includes an automatic link to track the purchase, with an expected delivery date. Even the Internal Revenue Service offers taxpayers a way to track the status of their returns and refunds, with expected deposit dates. Now think about how much more secure a mortgage applicant would feel if a home-loan application offered the same type of view into the approval process. That kind of transparency not only builds loyalty but leads to more word-of-mouth recommendations and positive online reviews. Credit is a famously murky area of people’s lives, but many companies are starting to jump in and help educate their customers. 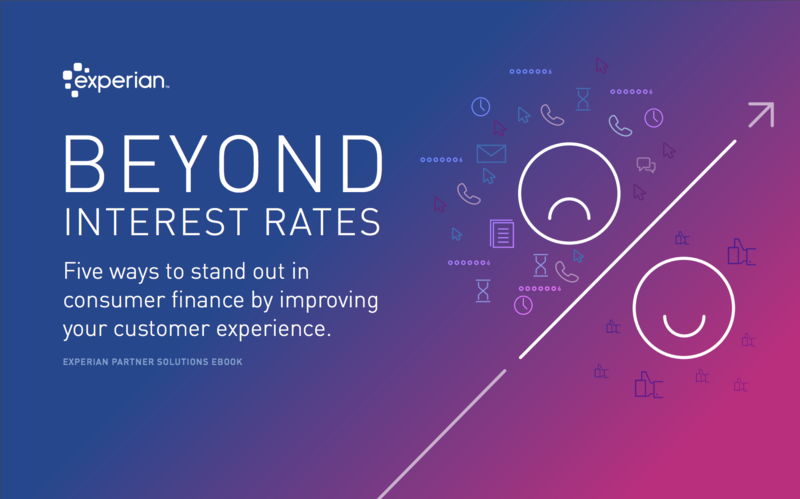 Experian has developed valuable tools and a deep well of helpful information that companies across various industries like telecommunications, retail, consumer finance and banking are using to help their customers become better educated about financial matters. By helping their customers take control, these companies are expanding their markets over the long term while earning revenue and building customer loyalty in the short term. Today’s customers are on a quest to establish more authentic experiences with the companies they do business with. They will quickly bolt if they sense an attempt to keep them in the dark. While they’ve dealt with it in the consumer finance category over the years, they will only get more and more intolerant of experiences that don’t live up to their expectations. If consumer finance companies want to stay competitive, they need to start rebuilding trust. A great first step is to seize upon every opportunity to improve transparency.